So I admit it... I hadn't really been working on my vest. I wrote earlier a draft of this saying I'd lost interest in it... but then I picked it up and did a few rows. :) So I guess I'm still plugging along! Soon I now need to started on crocheting borders on my baby blankets... because now I know my best friend Tabitha's unborn twins are girls!! Little Natalee and Kylee, being knitted together by God in her womb. Yay! So what have I been reading? Well since my last yarn along I've read In Too Deep, Wildflowers from Winter, Spirit Wars and I'm most of the way through As One Devil to Another, which is a modern day take on C. S. Lewis's The Screwtape Letters. I'll be giving it away when I review it! I'm not quite sure how that's going to work. Tyndale said they'd email me when I have to post my review, "sometime in April or May" and I've not gotten the email yet. I've also read two Xanth books (a silly fantasy series by Piers Anthony) specifically Swell Foop and The Xone of Contention. I'm still working my wedding planner, All Things Are Ready. Not sure when I'll finish it, but it is good. Another thing I'm still plugging away on? My Bible in 90 days challenge... we're like on day 80 something. I'm still a little behind. We'll see if I can do it! 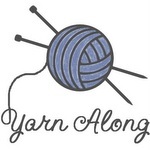 This week for the first time linking up with Tami and Kristine, as well as the normal yarn along with Ginny! Wow that is a lot of reading! Your blanket looks great! I can't wait to see what you knit now that you know the babies are girls! I love knitting for babies--such a joy! God Bless! Don't you love it when you get re-inspired? I bet that blanket will be done in no time at all :) Beautiful!! Twin girls! The crafting possibilities are endless! All my friends have boys, so far. Eager to see the finished blanket! So much reading.I'm not surprised the blanket was put down for a bit of a rest. I'm glad you are enjoying making it again. I do have a lot of reading that needs to be done along with my crafts.